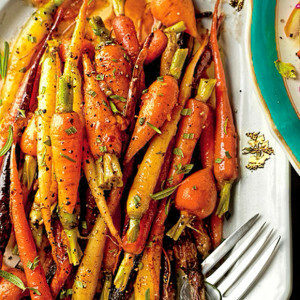 Roasting whole carrots in a hot oven and then giving them a final toss in a sweet glaze yields an unforgettable side dish. Preheat oven to 475°. Cut tops from carrots, leaving of greenery on each. Use a vegetable peeler to peel the outer layer of tops. Peel carrots, if desired. Toss together carrots and oil in a large bowl. Sprinkle with salt and cumin. Spread carrots in a single layer in an aluminum foil-lined jelly roll pan; bake 25 minutes or just until carrots are tender and browned. 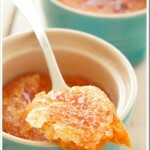 Meanwhile, bring marmalade and next 3 ingredients to a boil in a small saucepan over medium heat. Boil, often stirring, 4 to 6 minutes or until thickened. Stir in rosemary, if desired. : Look for multicolored carrots for a stunning presentation. If you can't find them at the supermarket, try a local farmers' market. We use a little chile pepper to add just a whiff of heat. Feel free to increase the pepper or omit it, if you prefer. Also, you can sub chopped fresh thyme or mild flat-leaf parsley for the rosemary. 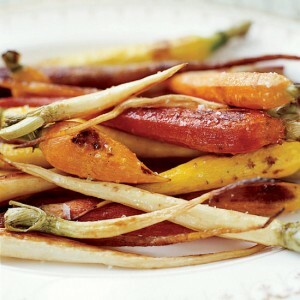 Caramelized vegetables with a lightly sweetened glaze. The ruby red pomegranate seeds and chopped fresh cilantro added an additional flavor boost. Melt 1 tablespoon butter in 12-inch skillet over medium-high heat. 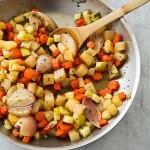 Add carrots, parsnips, turnips, and shallots and cook until lightly browned, about 5 minutes. Add cider, sugar, 1½ teaspoons salt, and remaining 3 tablespoons butter and bring to boil. 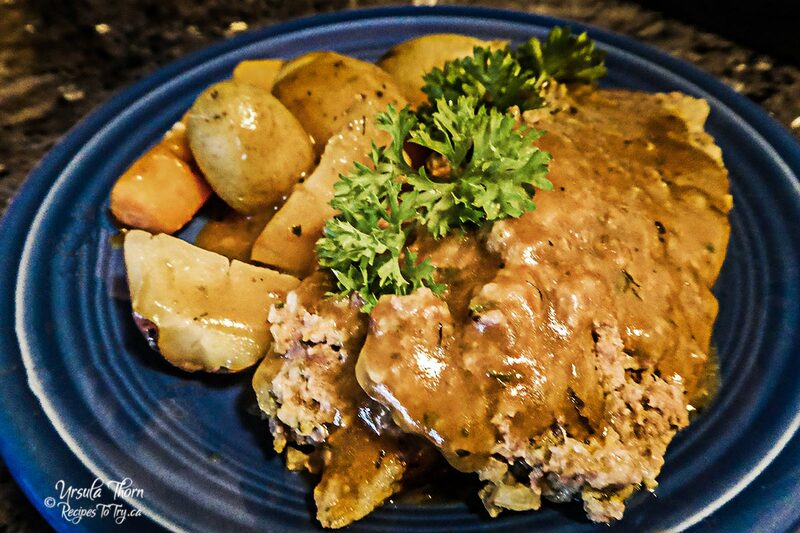 Reduce heat to medium-low, cover, and cook until vegetables are just tender, 7 to 10 minutes, stirring occasionally. 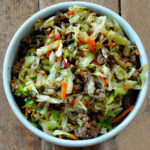 Uncover, increase heat to medium, and cook until vegetables are fully tender, about 13 minutes, stirring occasionally. Stir in apple and continue to cook until cider is syrupy and apple is just tender, about 2 minutes longer. Off heat, stir in pomegranate seeds, cilantro, and vinegar. Season with salt and pepper to taste. 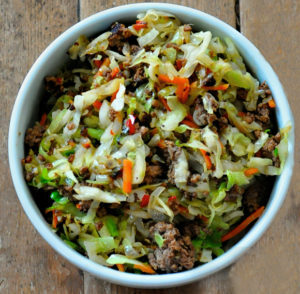 Transfer to serving dish and pour any remaining glaze over vegetables. Serve. If you prefer to use an equal amount of non-alcoholic sparkling or regular cider, reduce the sugar to 1 tablespoon. The apple should be left unpeeled. You could also leave out the pomegranate seeds and substitute 2 tbsp fresh tarragon for the cilantro. 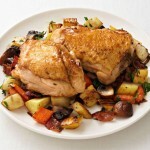 A quick and delicious one pan meal which comes out of the oven ready to eat in 15 minutes. Mix seasonings in small bowl. 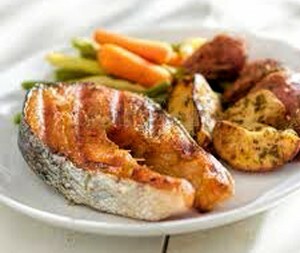 Sprinkle 1 tsp over salmon cover and set aside in the fridge. Sprinkle the oil on the vegetables mix to coat them add the rest of the seasonings mix and sugar mix again. You could at this point cover and put in fridge with salmon until ready to eat. 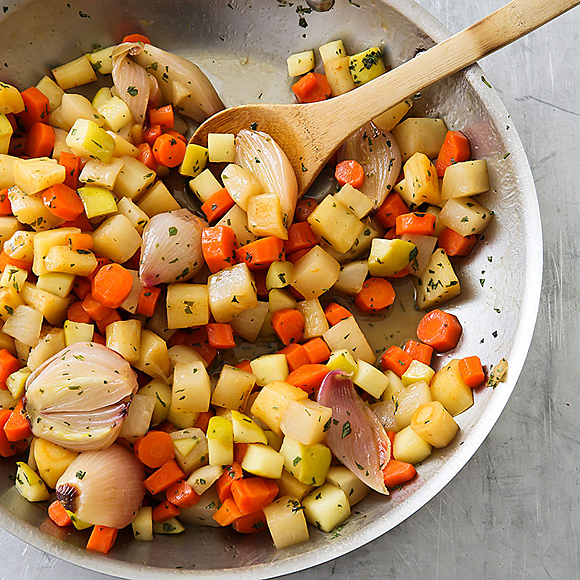 You could use different root vegetables with this. I used Baby Choy but did not precook like you would with root vegetables and it was very good. 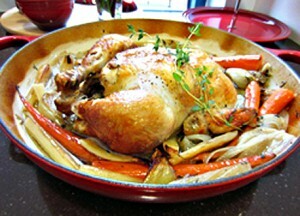 Preheat the oven to 375 degrees F. Heat 1 tablespoons vegetable oil in a large ovenproof skillet over medium-high heat. Season the chicken with salt and a few grinds of pepper. Add to the skillet skin-side down and cook until golden, about 5 minutes. Pour off most of the fat from the skillet; transfer the skillet to the oven (do not flip the chicken). 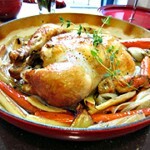 Roast 5 minutes, then flip the chicken and roast until cooked through, about 15 more minutes. Meanwhile, cook the bacon in the l in a large pot or pan over medium-high heat until crisp, about 5 minutes. Remove with a slotted spoon and drain on paper towels, reserving the drippings in the pot. Add the mushrooms, carrots, parsnips, turnips, red onion, 1 tablespoons water, ½ teaspoon salt, Apple or Maple Syrup and a few grinds of pepper to the pot. Cook, stirring occasionally, until the vegetables are tender, about 12 minutes. Return the bacon to the pot along with the parsley and thyme. Serve the chicken with the vegetables. For Regular oven directions see note at the bottom of the recipe. Love that these few ingredients come together into something much more than the sum of their parts. Place the parsnips & carrots s on the baking pan in a single layer. Drizzle with melted butter, olive oil, apple cider, and vinegar. Sprinkle with rosemary, salt, and pepper and toss to coat. Place on lower rack in the Cuisinart Steam Convection Oven. Set oven to bake steam, Temp at 450° F for 20 minutes or until they are tender and caramel-colored. 2. Place the parsnips on a large baking sheet with sides. Drizzle with melted butter, olive oil, apple cider, and vinegar. Sprinkle with rosemary, salt, and pepper and toss to coat. 3. Spread the parsnips in a single layer on the baking sheet. Roast, stirring or shaking the pan occasionally, for 30 to 35 minutes, until they are tender and caramel-colored. 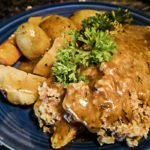 This is the ultimate winter comfort dish, to prepare as well as to eat. We add steam to an otherwise dry oven and the results are amazing! Wash and pat dry the chicken. Season the chicken with salt, pepper and poultry seasoning. 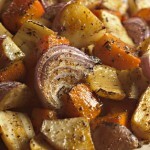 Scatter the onion, carrot, parsnips, thyme, and bay leaf in the Baking tray. Pour the apple cider, chicken stock and beer over the vegetables. 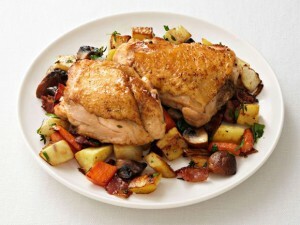 Nestle the chicken on top of the vegetables. Place the Pan on the lower rack in the Cuisinart Convection Steam Oven, select Bake Steam, oven temperature at 450° F. set the Time for 35 minutes or cook until juices run clear or an internal temperature of 165°F. Preheat oven to 450 F . Mix seasoned salt, pepper, nutmeg and sage in small bowl. Toss vegetables with oil in large bowl. Sprinkle seasoning mixture over vegetables; toss to coat well. 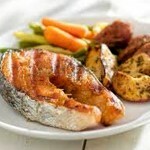 Bake 30 to 35 minutes or until vegetables are tender and golden brown. 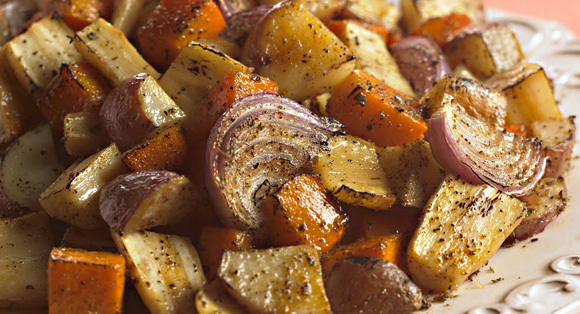 For Sweet & Savory Roasted Harvest Vegetables: Prepare as directed, using 1 tablespoon packed brown sugar, 1 teaspoon McCormick® Ground Cinnamon, ½ teaspoon each McCormick® Ground Ginger and salt, and ¼ teaspoon McCormick® Ground Nutmeg for the seasoning mixture. Sugar, for topping, if desired. Preheat oven to 350. Butter or spray 4 ramekins and set aside. In medium pot, cook carrots in water until fork tender. Drain and set aside. Combine remaining ingredients in food processor and pulse until well combined. Add cooked carrots and continue to pulse until smooth. 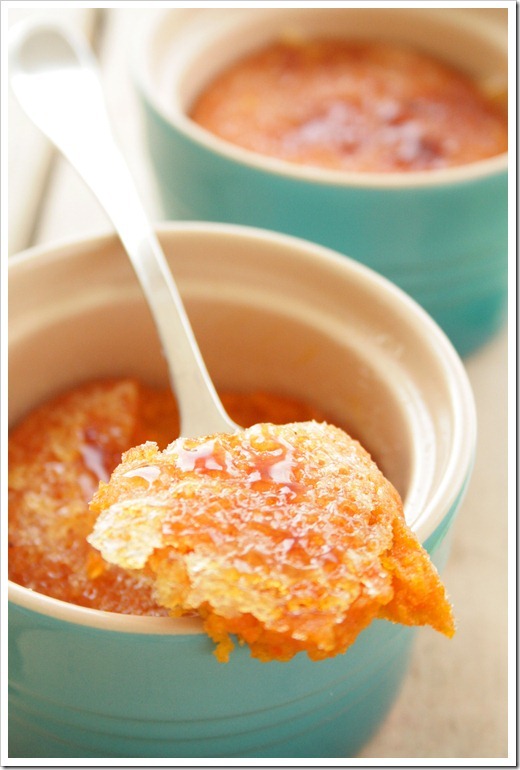 Divide carrot mixture into prepared ramekins and bake for 40-45 minutes, or until done. Remove from oven. Sprinkle with sugar, if desired, and caramelize with kitchen torch or place under broiler. Serve and enjoy!